$3,299.99 This may be in stock for quick delivery; please call! THE KING OF TWANG! Celebrate Rock and Roll Hall of Fame inductee & Grammy Award Winner, Duane Eddy and his legendary tone with his Gretsch "signature" model guitar. 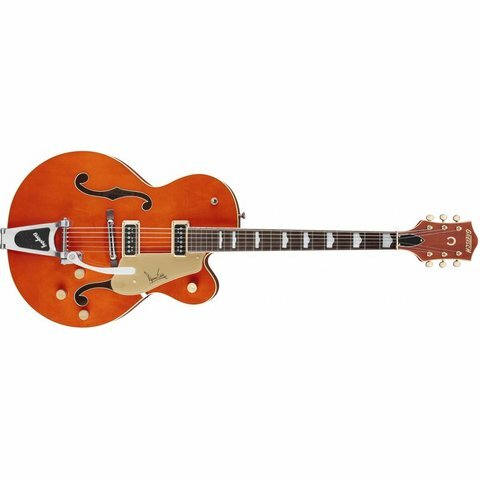 Features include twin DynaSonic single-coil pickups, Tru-Arc "rocking" bar bridge, lacquer finish, trestle bracing and special neck & headstock profile replicated from Duane's original G6120, heard on many of his chart-topping hits.